Ambulances are a key tool on the front lines of any emergency. That's why volunteers, paramedic groups, the provincial government and the federal government are helping send four of them to Ukraine. Ambulances are a key tool on the front lines of any emergency. That's why a bunch of volunteers, paramedic groups, and the provincial and federal government are helping send four of them to Ukraine. The ambulances are from Saskatoon, Parkland Ambulance in Prince Albert, Sask., Duck Mountain EMS and Associated Ambulance services in Edmonton. They are due to arrive in Kyiv, Ukraine sometime next week. Dave Dutchak is a consultant with MD Ambulance, and he's also a member of a Saskatchewan-Ukrainian Relations Advisory Committee that reports to the province. "There's a significant need there with what's going on over there," he said. "There are some reports they could use up to 45 ambulances, and so we're looking at a two-phase project, this being the first phase with four ambulances." He says he hopes there will be more ambulances to send again next year. The group held a display in Saskatoon Saturday afternoon to share more information about the donation during Ukrainian Day in the Park at Kiwanis Park. The donation comes with help from many volunteers, paramedic and health professional groups, as well as the provincial and federal governments. Dutchak said the groups that planned for the donation include MD Ambulance, the Paramedic Chiefs of Canada, Saskatchewan Emergency Medical Services Association, the Saskatchewan-Ukrainian Relations Advisory Committee, the Ukrainian-Canadian Congress and its Saskatchewan branch and EuroMaidan Canada. He hopes it shows people in Ukraine that people in Canada — including health professionals — are supporting them. 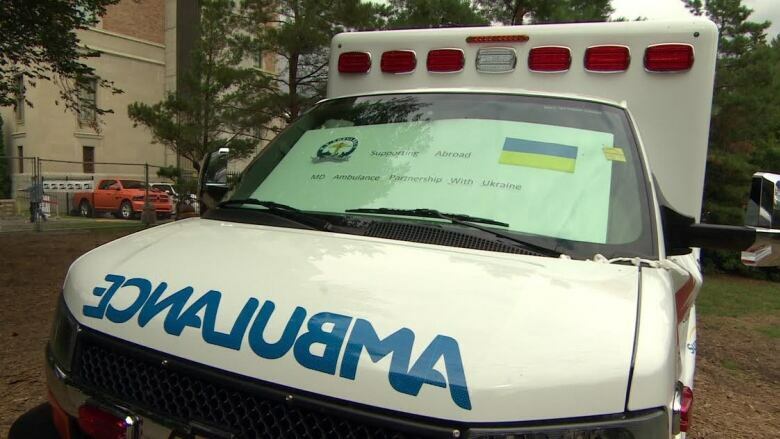 He hopes to have up to 12 more ambulances from Canada make their way to Ukraine by next year.